By Ondrej Mirtes. In this article, I’d like to introduce you to the concept of type safety and how it can improve the reliability and stability of your code. Once your code is more type-safe, and that fact is verified by automated tools, you can cherry-pick which parts of your application need extensive unit tests and where you can rely just on well-defined types. PHP Unit, Mockery, Type Hints, Async PHP, building a REST API, training programs, PHP isolation and security, serverless computing, Laravel auth, and more. PHP Daemons, Evolving PHP, containers, accessibility, Lumen, code reviews, signing git commits, running a user group, and more. Worker Queues, Async with Generators, and PHP Sessions in Depth, Hiring PHP Devs, Laravel Collections, Security & Logging, and more. December 2017: Alexa skills, Chat bots, Machine Learning, Event Sourcing changes, PHP_CodeSniffer, PHP 7.2 w/libsodium and more. FREE issue! November 2017: Magento, Laravel Queues, Payment Gateways, PCI-DSS Compliance, PHP Frameworks and more. Read the October 2017 issue. 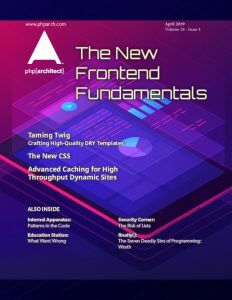 In this issue, we cover Composer, Private Packagist, Machine Learning, Doctrine, PHP 7.2, and more. PHP TestFest is a global event organized by the PHP community at large, where an effort is made each time to increase the test coverage of the PHP engine itself. Learn how you and your user group can participate.